« Real Targets and real funding for GBR water quality needed. A central source for all everything related to the 2015 election and the FNQ environment, bookmark this page and visit regularly for updates. 2015 and a sneaky snap election has caught many people napping, but here at CAFNEC we are well into implementing an election campaign plan. The future of the Great Barrier Reef is polling at almost unprecedented heights as an election issue this year, and the frankly shocking rollback of environmental protection laws in the past 3 years is of concern to us all. This election we will have a strong focus on the reef with our vote for the reef campaign and we will be producing an election report card and other materials so we can all make an informed voting decision based on the candidates policies on local and state-wide environmental issues. We are running events, outreach at community events, letterboxing and informing the community during this important time for the future of our FNQ environment. We are sending out a massive thanks to all the volunteers, management committee members and CAFNEC supporters who contributed to a successful election campaign period. 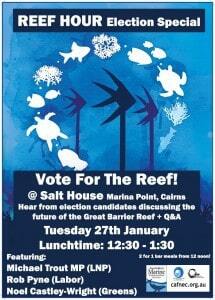 Event wrap up: On the 27th of January CAFNEC and AMCS hosted at the Salt House in Cairns an important event in our ongoing series of Reef Hour events, the Reef Hour – Election Special event. 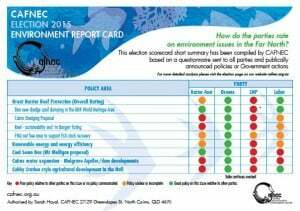 The outcomes of a pre-election survey of local candidates by CAFNEC (the Cairns and Far North Environment Centre) has shown major differences between the candidates and their parties on key environment issues. 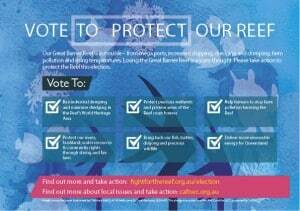 In the lead up to the 2015 election CAFNEC is encouraging everyone to Vote For The Environment and Vote for the Reef. Cairns and Far North Environment Centre (CAFNEC) is today inviting media and the public to attend a very important event in the lead up to the State election. Cairns and Far North Environment Centre (CAFNEC) has welcomed commitments from the Labor party to improve reef health released in a document entitled “Saving the Great Barrier Reef – Labor’s plan to protect a natural wonder” released yesterday. The document contains specific reference to the Cairns dredging proposal, suggesting that if Labor forms Government they will stop throwing money at this risky and unnecessary project. CAFNEC tells you how to vote! OK, got your attention, good. This article is not going to tell you who to vote for, but actually how to vote. We have received a number of questions on how the Queensland voting system works, especially around how preferences are distributed. 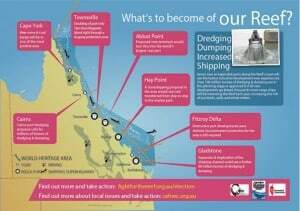 Politicians confused about policy on Cairns dredging? The LNP appears to be confused about their own policy regarding the Cairns port dredging proposal in the Great Barrier Reef Marine Park. The community has been told that State Government policy was NO new dumping in the Marine Park. However last week on ABC Radio, Cairns MP Gavin King blamed the federal Government for ruling out dumping of new dredge spoil in the Marine Park and stated that sea dumping of dredge spoil was his preferred option. Real Targets and real funding for GBR water quality needed. 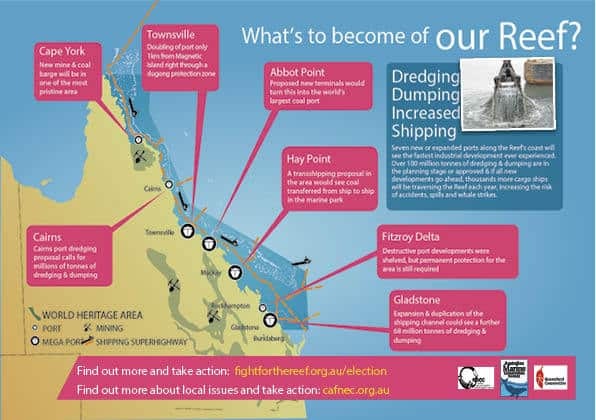 Cairns and Far North Environment Centre (CAFNEC) has called on all political candidates to make clear their position on Cairns dredging and dredge spoil dumping in the lead up to the State election. Evidence has been presented in a new report for what many of us know,- people care about the Great Barrier Reef and want to see it protected. They are willing to pay for this to happen and we at CAFNEC think they are also likely to vote with the reef in mind.. The Reef Hour – Election Special event will feature political candidates discussing their positions on issues relevant to the protection of the Great Barrier Reef. What: Introduction to the issues from CAFNEC, Short talks from candidates, Q&A. Help us to get voters to pledge to vote for the reef. Drop in to the office or contact us to get pledges to distribute to friends, family, at work or in your community group. 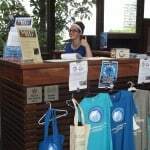 Be a reef champion and share your pledge on social media too! 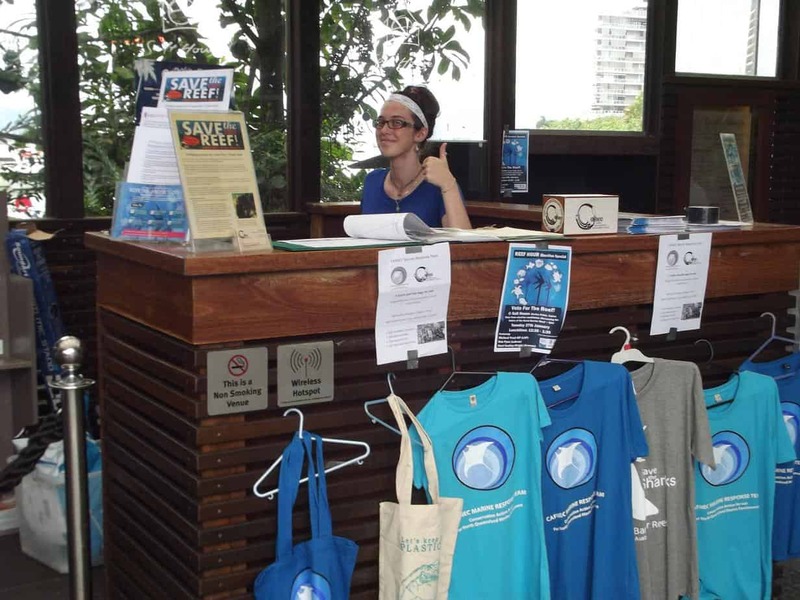 Leafleting campaign – help us to distribute flyers encouraging people to vote for the reef and informing people of the current state of our environmental protection laws. Contact us with your availability and preferred areas for letterboxing. Election day activities – are you available to help out on election day? Let us know. Rusty’s Market stalls – we will have a presence every weekend up to the election, can you help us out? Are you able to organise and run a stall at other events in the lead up to the election? Other events – if you would like to be part of colourful and fun actions in the lead up to the election, get in touch. Dressing up and having fun for a good cause will be encouraged. Together we can really make a difference and push for a better deal for our FNQ environment.